Don’t get me wrong. I’m not a tree hugger. I burn wood, eat meat and enjoy killing God’s great animals for sport. However, a recent trip to the New York Department of Environmental Conservation (NYDEC) left me asking this question: Is it ethical to raise, breed and grow whitetail deer for human benefit? Hunting ethics and sportsmanship are the core roots of our sport and without them where would we be? I don’t want to imagine. To me, raising a wild animal for personal benefit crosses this line. Free roaming whitetails continue to be the No. 1 hunted big game animal in North America and this should give whitetails a free pass from captivity. Let’s take the buck pictured in this post. This was one of two trophy animals on display at the NYDEC event I attended. Although impressive to look at, I couldn’t help but wonder if the deer was enjoying the event as much as the dozens of gawkers who were looking at him. For those of you unfamiliar with whitetail farming and its benefits, whitetails are grown and raised for one reason – money. Farmers either sell the animal for breeding stock [at a high-fenced facility] or collect their urine for scent sales. Either way, I’m opposed to it. This hits at the heart of my argument. We’re not dealing with an Angus or an Appaloosa, here. The whitetail continues to roam free in all but five U.S. states – Nevada, Utah, California, Hawaii and Alaska currently have no published whitetail herds. I’d like to see it kept this way. I believe our Creator put the whitetail deer on earth for reasons unknown, but I’m pretty sure putting him in a pen wasn’t one of them. This entry was posted on Thursday, September 30th, 2010 at 5:16 pm	and tagged with deer, ethics in hunting, Greg Johnston, pen-raised whitetails and posted in 2010, Guest Contributors, Uncategorized. You can follow any responses to this entry through the RSS 2.0 feed. I’m not sure where people will weigh in on this, but here’s my thought … I have a hard time thinking anything is ethical when an animal that has been known to clear 40+feet in the air when it’s running is penned up in a 10’x10′ dog kennel. I appreciate your thoughts on this topic. For me, there are a couple of different levels to this. 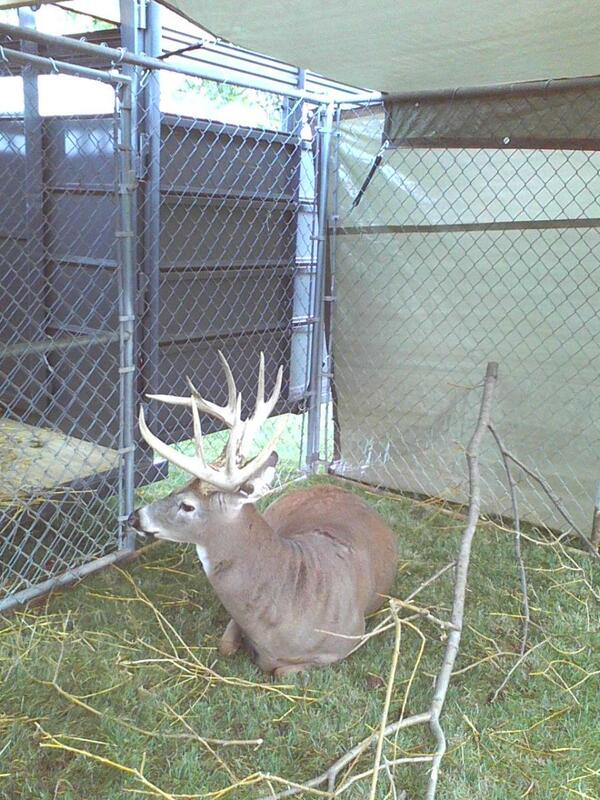 In one case, I know of situations where deer were kept in captivity more or less as pets. In the cases I’m thinking about, the deer were left abandoned as fawns when their mothers were killed on the highway. The deer seemed very content and happy, and from what I could tell, a mutually beneficial relationship. Let’s face it though. That is more of a storybook scenario and not a terribly common situation. I have always been deeply disturbed by deer farmers, particularly those who raise the bucks to be enormous so that they can profit by selling them to “hunting” reserves. Frankly, I would like to see high fence hunts eliminated all together, which would choke off this type of deer farming. What is even more alarming to me is how many hunting shows I watch on TV nowadays that are obviously being filmed at high fence ranches. I recently saw a hunt featuring hunting celebrity Larry Weishuhn (Dr. Deer) that occurred in an enclosure. I was sickened by how he was trying to make the hunt out to be real, saying things like “There are a lot of great deer in this area,” and “My guide really knows how to get in on great animals,” etc. None of this is good for our sport. Some more feedback on this post. Nick, I also saw that Dr. Deer hunt. Sick. I have a high tolerance for allowing others to do as they wish, provided it follows laws and doesn’t cause harm to humans, the environment or the hunted species. So if this is how some people want to hunt, that’s fine with me. Why? I see hunting ethics as a spectrum, and I’m not sure it’s fair or right for some of us to draw a line within that spectrum and say, “Everything on this side of the line is OK; everything on the other side is not.” What if the guy drawing that line is someone like Tred Barta? Good lord, most hunting as we know it today would end. That said, I see farmed-whitetail hunting as being in pretty much the same category as put-and-take fishing, or planted-bird hunting. I know there’s a market for it, but as I enter into my fifth year of hunting, I definitely crave a more authentic experience. So, no, I sure wouldn’t be interested in hunting that buck.